The role of a Quantity Surveyor is to provide accurate and timely cost advice throughout both the planning and construction phases of a building project, ensuring clients receive maximum value for money by reducing both capital and on-going costs and preventing cost overruns. In the initial cost planning phase, a Rawlinsons (W.A.) Director will always be heavily involved. In the early stages of design there is often a real absence of documentation, therefore, at this time, the experience of the Quantity Surveyor is critical in making the appropriate allowances for non-detailed items as well as the identification of risk and allowing a suitable contingency to cover such items. A Director and Senior Quantity Surveyor (Cost Planner) attend all design team meetings throughout the design and documentation phase and not just those meetings specifically related to costings. In this way any design issues can be solved in the most economical manner. Rawlinsons (W.A.) 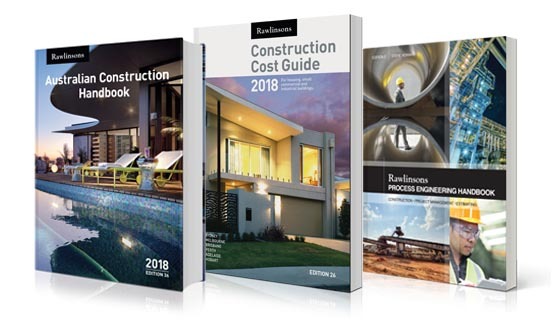 compiles and edits the Rawlinsons Australian Construction Handbook, which has an extensive annual circulation within the construction industry. As a result, Rawlinsons (W.A.) have a full time research and development officer in their Perth office, whom ensures that their cost database has the most up to date pricing available, tracks market trends, labour awards and base material costs. Through this publication Rawlinsons (W.A.) has a great understanding of bench marking rates for various facilities. At each cost planning stage Rawlinsons (W.A.) reviews how the project is tracking against the industry bench marking rates for the project. Should the project be tracking over standard bench marking rates the Quantity Surveyors review and provide possible alternatives to achieve required rates. When producing cost plans, Quantity Surveyors receive service cost estimates from the engineers. Rawlinsons (W.A.) has an in house Quantity Surveyor, specialising in measurement and pricing of services trades, who carries out their own independent estimate and compares it to that of the consultant. If this shows any anomalies Rawlinsons (W.A.) will meet with the relevant consultant in order to discuss any possible reasons for variance and ensure that the scope of service allowed for is in line with the project brief. Any estimates which are showing a significant variance to cost benchmarks are reviewed in order to investigate the driving factors. Workshops / value engineering are often required with the consultants to achieve the same objective, but with a cheaper alternative system. Rawlinsons (W.A.) adopts a pro-active approach in managing and leading value engineering workshops throughout all stages of cost planning. The aim of these workshops is to question and interrogate the design to ensure that not only the most cost effective capital cost construction methodology is chosen but also consider the financial impacts each option will have on the future facilities management of the building. In the Documentation and Tender Phase of a construction project, Rawlinsons (W.A.) Quantity Surveyors will insist on a minimum of 95% complete documentation prior to undertaking the Bill of Quantities production. This requirement ensures abortive work is minimised and that accuracy in the measurement of all trades is improved. Audits of the contract documentation are completed before going to tender, ensuring it complies with the agreed design development proposal. This audit also often highlights document discrepancies before construction commences, thus saving both time and money during the construction phase and often avoiding potential Extension of Time claims from the Contractor. Rawlinsons (W.A.) insists that the Bill of Quantities and tender estimate are prepared from the same documents that are issued to tenderer's. Rawlinsons (W.A. )'s objective at pre tender estimate is to provide a mid-range estimate of the contractors tendering for the works with an expectation that a number of tenders will be below the PTE and therefore achieve a successful tender within the projects financial restraints. In some projects, the next phase in construction cost consultancy is to produce a comprehensive, accurate, and easy to follow Bills of Quantities (BOQ). Rawlinsons (W.A.) Directors maintain a hands on approach during this phase and are responsible for the take-off of the most significant and specialist trades. During construction,Rawlinsons (W.A.) are of the belief that the Design Team, Client, Contractor and all relevant Stakeholders need to adopt a collaborative approach in order to produce the best results. It is essential for a Quantity Surveyor to build a productive relationship with the contractor in order to ensure that progress claims are accurate, variations are agreed upon in a timely manner and that any foreseen variations/issues can be discussed at the earliest stage. Rawlinsons (W.A.) issues a comprehensive Financial Report on a monthly basis detailing all known and estimated costs on a project including any costs associated with EOT claims and the ‘below the line’ costs. Reports highlight any concerns or foreseeable issues as well as commentating on the level of contingencies remaining in order to complete the works within the allocated ETC. Additionally cash flow forecasting is included and updated in each report. So, in a nutshell, a Quantity Surveyor estimates and monitors the cost of a construction project, protecting financial interests and ensuring you, the client, receives the best value for money from the design, construction and operation of your asset. Think your project could benefit from a Quantity Surveyor? Contact Rawlinsons (W.A.) today for an obligation free quotation.